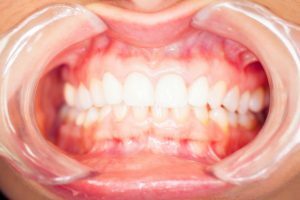 Dental veneers are fine shells made typically porcelain or composite resin, that are placed over a tooth to cover chips and cracks, especially on the front teeth. Composite resin veneers can be cheap and quick to put on, but only last a few years and are most susceptible to get cracked. Porcelain veneers are more expensive, but they worth it for its strength and durability. A dental crown is a cap that sits over a damaged tooth to provide a good biting surface and maintain the structural integrity of the tooth. Without a crown, a damaged tooth can end up breaking after a while. Bridges are a group of two or more crowns together with the purpose of replace several missing teeth in a row. The crowns at the end of the bridge can be installed on the remaining healthy teeth, or in dental implants. These are a type of halfway point between veneers and crowns that replace specific parts instead of replace the whole crown of a tooth. Inlays are used to cover up cracks or holes in the “dips” of teeth, known as cusps. Onlays cover the raised ridged areas. These are useful for chipped or cracked teeth that don’t quite need a full restoration, or to plug gaps left by root canals or tooth fillings. Dentures have the purpose of replace part or the entire arch of missing teeth. Dentures can be made of a variety of materials all depending on the current budget and aesthetics. Years ago it was common to simply sit the dentures on the bare gums of the person, but now they’re being supported or stabilized by dental implants. Dental implants are the top in tooth restorations. A single dental implant can bring back the look, shape, feel just as a natural tooth, they’re like having your real tooth back. Dental implants can also be used to hold other restorations, such as bridges and dentures. This helps them to be much more stable and effective than they used to be in the past.